Heat the water and sea salt lightly until the salt dissolves and let cool to room temperature. Wash the cucumbers and drain. Wash the grape leaves and pinch off the stem, also pinching off a little of the leaf where it joins the stem, as this holds dirt. Place the grape leaves in the bottom of the jar. They will also stick to the sides of the jar if they are a little wet. Pack the cucumbers tightly in the jar standing them vertically. Distribute the other ingredients as the cucumbers are added to the jar. Poor the brine over the ingredients enough to cover the cucumber tops. 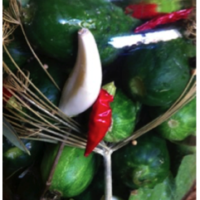 The tops of the cucumbers must be covered in brine to prevent spoilage. Place a piece of cheesecloth over the jar and secure with a rubber band. Let sit at room temperature for 3-5 days. Lactic acid fermentation speeds up in warmer temperatures and slows down in cooler temperatures. You will know when fermentation is active when a few small bubbles begin to appear in the jar and it starts to smell a little sour. Place the lid on the jar and store in the refrigerator. The dill pickles will still ferment very slowly in the refrigerator, but will keep for months, unless of course they get eaten sooner. Makes 2 quarts or ½ gallon dill pickles. The proportion of salt is 3 Tablespoons sea salt to 1 quart of water. To measure how much salt water is needed to make your dill pickles, you can pack your jar with cucumbers and then fill the jar with water. Pour off the water into a measuring cup and you will know exactly how much brine to make. The grape leaves are optional, but the tannins in the leaves make the pickles crispier. If you do not have access to grapes, wild grapes are plentiful and may be used as well. Select newer growth leaves that are more tender. 1. 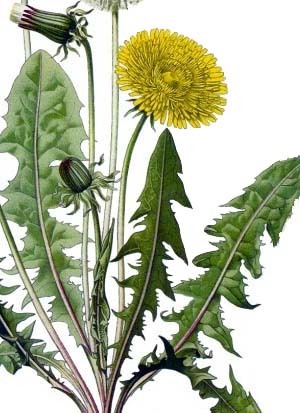 Wash dandelion, drain and cut into small pieces. Separate roots and greens if using the whole plant. 2. Warm oil in a heavy skillet. 3. Add dandelion roots first, then greens. Sauté the roots first until golden, then add the chopped greens, cooking until the color turns bright green. 4. Add miso on top of dandelion green. Stir with a spoon or chopstick, breaking up miso into smaller sections until it melts into the dandelion. 5. Shut off flame and place in a small serving bowl. 6. Serve a rounded teaspoon on top of rice cream porridge or other grain. 1. Place sesame seeds in a bowl and cover with water. Pour off the seeds that float to the top into a fine mesh strainer. 2. Repeat, covering with water and pouring out the seeds suspended in the water, somewhat like panning for gold. Continue adding water and pouring off seeds until just a few are left in the bowl. Check these last seeds for stones or pieces of sand. If there are more than two or three pieces of sand or stones, repeat this washing process again. 3. Drain the seeds in the strainer. 4. Heat a skillet and roast the salt, stirring, until the salt is dry and loose. The color may darken slightly. 5. Place the roasted salt in the suribachi and grind. Periodically, brush the salt out of the grooves of the suribachi with stiff bristled pastry brush. Continue grinding until the salt feels powdery and not “grainy”. 6. Dry the sesame seeds before roasting. Place in a heavy skillet or Dutch oven over a medium flame. Stir continuously with a wooden spoon, drying until the seeds no longer stick to the wooden spoon. 8. Cover the bottom of the pan with a thin layer of sesame seeds. If the seeds start popping out of the pan and all over the stove top, reduce the heat. 10. Pour the finished seeds into the suribachi with the ground sea salt. Continue roasting the seeds as described above until all the seeds are roasted. 11. 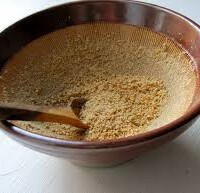 Grind the seeds in the suribachi with the sea salt until about 2/3 of the sesame seeds are crushed. 12. Serve a sprinkling on grains as a condiment. Gomashio may be stored in an air-tight jar for about two weeks for maximum flavor and freshness. Here’s a novel way to make use of those otherwise discarded watermelon rinds. 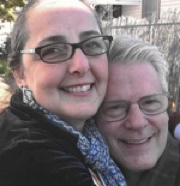 One of the principles of macrobiotics is “no waste.” This recipe let’s us put it into action. 1. Cut away the outer green skin of the watermelon. Dice the white part into 1/2″ cubes. 2. Warm the oil in a cast iron skillet. 3. 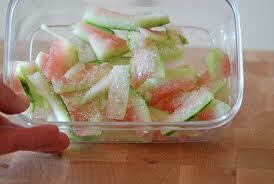 Add the watermelon rind. Saute 2-3 minutes over medium high flame. 4. Add miso. Mix in until the miso melts. 5. Cover pot with a lid and cook until the watermelon rinds are semi soft. 6. Serve as a condiment for grain, bread, or pasta. 1. Unfold dulse and check for sea shells and stones. 3. 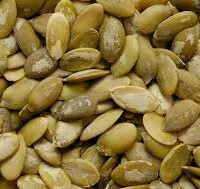 Place pumpkin seeds on another cookie sheet and bake at the same time for 10 to 15 minutes. 5. Place dulse in a suribachi and grind to a fine powder. 7. Serve over grains, porridge or creme soups.